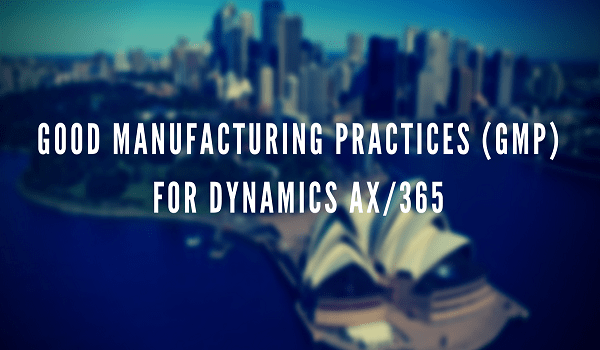 Microsoft Dynamics 365 is a feature rich business system that can help Good Manufacturing Practices (GMP) regulated companies easily include GMP processes within their business processes. Our very own Navneet Sekhon, President of AXSource Consulting Inc. (AXSource’s Regulatory and Quality Practice) delivered a session on the topic of Good Manufacturing Practices (GMP) For Microsoft Dynamics 365 / AX to the Microsoft Dynamics community at the AXUG Summit Dublin this April. The turnout was great as the unique presentation was unlike any other session at the conference as her session focused on regulatory & quality compliance within the Life Sciences industry. The industry is highly regulated, and companies face many challenges in terms of the requirements for computer systems in a GMP regulated environment. If regulatory requirements are not met, companies will be liable and can face several risks and damages not to mention marketing delays until compliance is fulfilled. A major key takeaway from Navneet’s presentation was the implementation of Dynamics 365 within the Good Manufacturing Practices. The advantage of utilizing Dynamics 365 in the regulated industries is that the service is in the cloud. Although many Life Sciences companies are comfortable with their legacy systems, the change management of cloud can take some getting used to but will give companies efficient results and best practices in the long run. From making the change to the cloud, this will also give companies the opportunity to utilize innovation within their business. There are many benefits when implementing GMP within Dynamics 365 as many key processes are GMP compliant and can also minimize system validation efforts. In terms of the drawbacks, it is quite a costly transition as you must invest time and money into the implementation. However, the Return on Investment (ROI) is high. Results will eventually start to show in the long run with regards to how compliance is managed in Dynamics 365. With regards to GMP, agencies such as the US FDA, Health Canada, EMA (EU) and MHRA (UK) require that systems be validated. These agencies help to ensure products and solutions meet the required regulations and can, therefore, ensure companies maintain their quality standards. As GMP is a major factor within regulatory & quality, Navneet’s session at the AXUG Summit in Dublin was compelling as her discussion cleverly tied Good Manufacturing Practices within Microsoft Dynamics 365 / AX. According to these requirements, she isolated system modules/areas for the attendees that require validation/verification thereby limiting the burden of validation. Navneet presented a snapshot of the validation methodology employed by AXSource. She received an excellent evaluation of her expertise/knowledge base from the attendees.